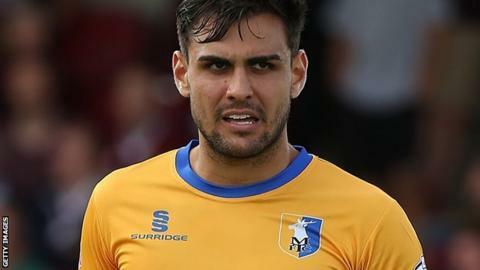 Two goals in five second-half minutes from Ryan Tafazolli and Jack Thomas helped Mansfield beat Stevenage and claim a third away win of the season. Stevenage had slightly the better of a scrappy first half, but Tom Conlon headed straight at keeper Brian Jensen. Mansfield went in front when Tafazolli headed home powerfully from Adam Chapman's corner before Thomas slid in Craig Westcarr's measured, low centre. Boro almost pulled a goal back, but substitute Dipo Akinyemi drilled wide. Mansfield's win moves them up into seventh place in the League Two table, while a third defeat in a row for Teddy Sheringham's side means they sit in 20th. Match ends, Stevenage 0, Mansfield Town 2. Second Half ends, Stevenage 0, Mansfield Town 2. Ronnie Henry (Stevenage) wins a free kick on the right wing. Corner, Mansfield Town. Conceded by Ben Kennedy. Jack Thomas (Mansfield Town) wins a free kick on the left wing. Substitution, Mansfield Town. Chris Beardsley replaces Matt Green. Attempt missed. Steven Schumacher (Stevenage) right footed shot from outside the box is close, but misses to the right. Connor Smith (Stevenage) wins a free kick in the attacking half. Jamie McCombe (Stevenage) is shown the yellow card. Substitution, Mansfield Town. Lee Collins replaces Craig Westcarr. Matt Green (Mansfield Town) is shown the yellow card. Attempt missed. Dipo Akinyemi (Stevenage) right footed shot from the right side of the box is close, but misses to the left. Hand ball by Reggie Lambe (Mansfield Town). Ben Kennedy (Stevenage) wins a free kick in the defensive half. Attempt saved. Ryan Tafazolli (Mansfield Town) header from the centre of the box is saved in the centre of the goal. Attempt saved. Matt Green (Mansfield Town) left footed shot from the centre of the box is saved in the bottom left corner. Jack Thomas (Mansfield Town) wins a free kick in the attacking half. Foul by Connor Smith (Stevenage). Substitution, Stevenage. Dipo Akinyemi replaces Tom Conlon. Adam Chapman (Mansfield Town) wins a free kick in the attacking half. Attempt missed. Connor Smith (Stevenage) header from the centre of the box is close, but misses to the left following a set piece situation. Reggie Lambe (Mansfield Town) wins a free kick in the attacking half.